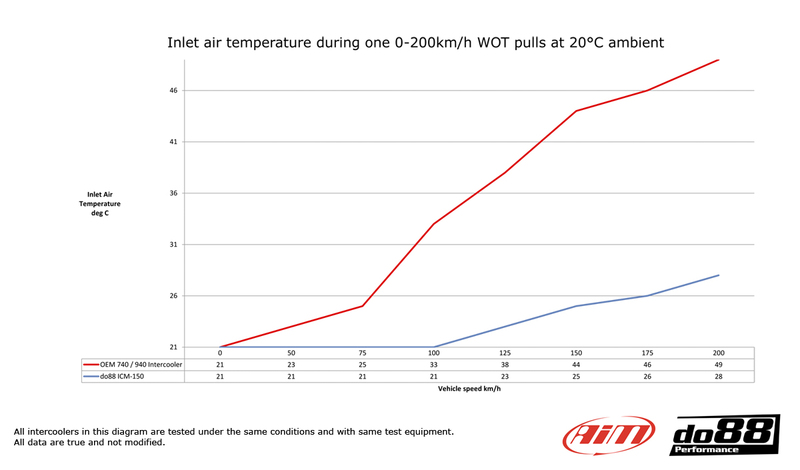 The best Volvo 740 940 Turbo 1981-98 performance intercooler kit on the market! - Core volume: 11906m3 (5377cm3), do88 is 221% larger! 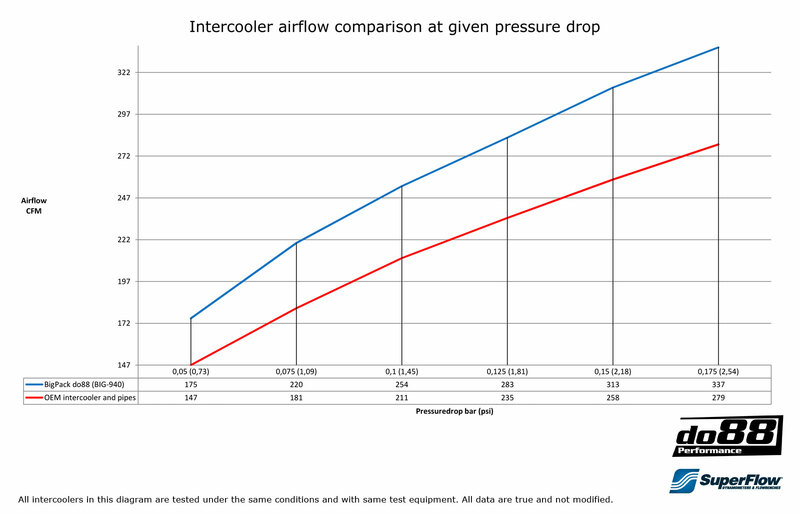 - Air flow at 0,15bar/2,18psi pressure drop: 341CFM (268CFM), do88 27% higher! BigPack includes a full aluminum performance intercooler and a complete 2,5” / 2,75" pipe kit and silicone hoses. This BigPack replaces everything between the turbo outlet and the throttle body this why it drastically improves the airflow / cooling performance compared to the original. The pressure pipe is manufactured in 2,5” / 2,75" mandrel bent aluminum pipe. Note! IF your current pipes have BOV or/and temperature sensor connections, these pipes will NOT fit! The best Volvo 740 940 Turbo performance intercooler pipe kit on the market! This kit is for you with significant horsepower goals that want to upgrade to the absolute best! 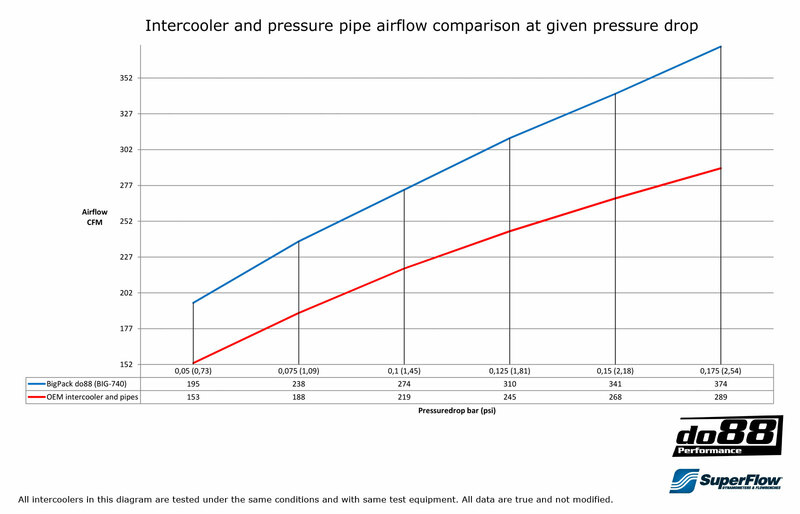 Our pressure pipe has considerably better airflow than the stock pipe. 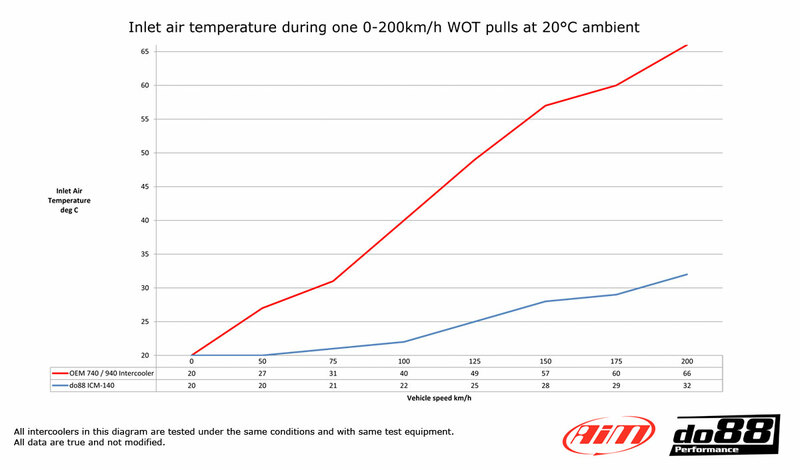 This has been verified in several tests, both in car and in our own SuperFlow SF-1020 flow bench. 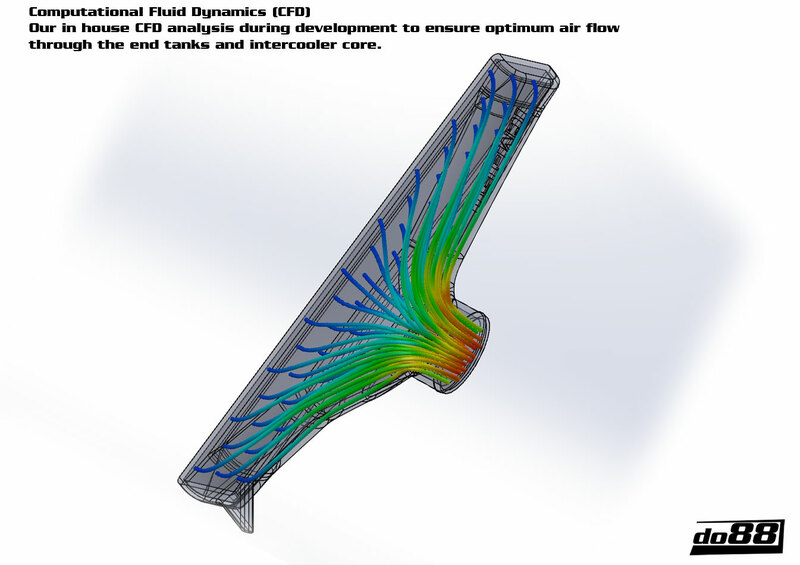 - Significantly improved Air flow! - Designed to handle high pressure and temperatures! The pressure pipe is manufactured in 2,5 / 2,75” mandrel bent seamless aluminium pipe. 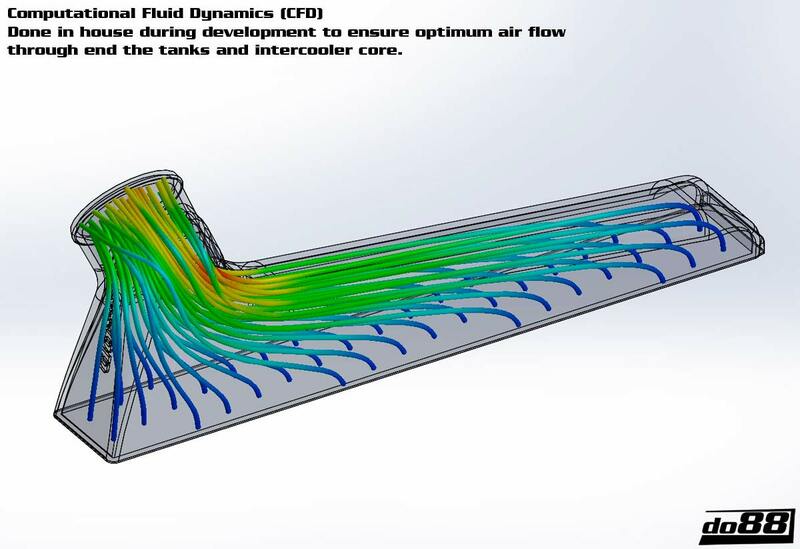 Always remember that the OEM intercooler pipes and hoses was designed for the power level the car was built for and a power increase or even very hard use of the car in a standard version may cause that the OEM pipes and hoses don’t have the performance you need. So only after engine software tune do88 pressure pipes will give a performance increase over the OEM pipes! do88 pressure pipes comes with all hardware necessary for installation. Note. 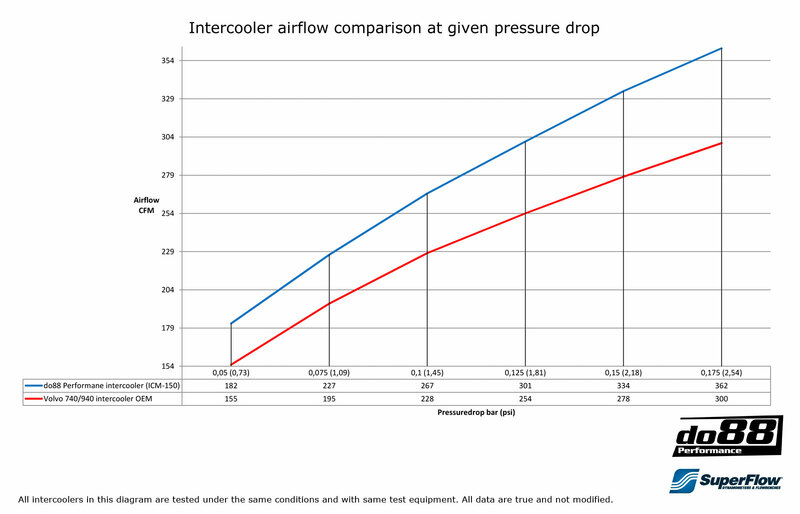 Does not fit models in the list above with original temperature sensor or By-Pass valve connection on the intercooler pipe. This is the best Volvo 740 940 performance intercooler on the market! - Core volume: 13945cm3 (8465cm3), do88 is 65% larger! 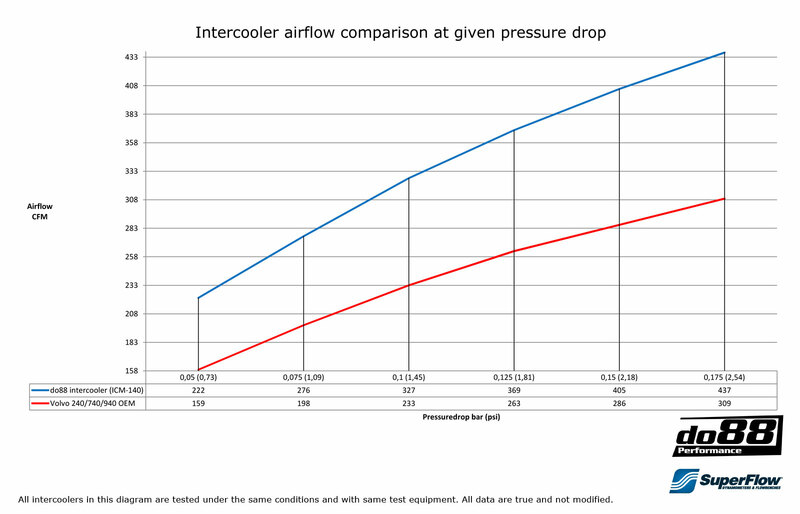 - Air flow at 0,15bar/2,18psi pressure drop: 334CFM (278CFM), do88 20% higher! A hose kit developed by do88 to replace OEM inlet hose! These hoses are entirely manufactured in high quality silicone for best finish and durability. With integrated steel wire to prevent the hose from collapsing under negative pressure and three to five layers of reinforcement, depending of the inner diameter and position. The original hoses are manufactured in rubber that not seldom cracks from age. This is the durable solution for you that in addition improves the looks! The heating element for the crankcase ventilation system which is mounted in the hose needs to be modified a bit before mounting. You need to file down the plastic rim a bit before mounting. See additional product picture!